The reason why many people living with Marfan syndrome cannot gain weight isn’t fully understood. It may have something to do with the underdeveloped muscles that are associated with Marfan syndrome. We hear from many people who want to get involved with body building or weight lifting to build muscle mass, but this is not recommended for people with Marfan syndrome. It can contribute to aortic enlargement. Unfortunately, the best suggestions we have for anyone who wants to gain weight is to consult with a nutritionist or dietician. We support the national nutritional guidelines that advocate a low fat and low salt diet, with appropriate portions of vegetables, fruits, and grains related to age and overall body weight, and nutritional snacks. For those on Coumadin there are certain dietary guidelines. 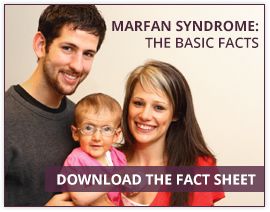 Our literature indicates that there is no evidence of any specific deficiencies in Marfan syndrome or evidence that any particular food or supplementation provides any benefit. We recommend that you talk to you doctor before taking any supplement to ensure that it does not interfere with any medications you are taking. What has it been like for you to deal with the Marfan body type?